Market Square Condos sont condos les plus exclusifs au charmant village européen de Beaver Creek, qui dispose d'une patinoire de glace toute l'année, les superbes boutiques, des restaurants gastronomiques, restaurants occasionnels, et les activités de kid-friendly. Ce condominium de luxe est situé à seulement deux étages au-dessus du Centre Vilar pour les arts de la scène avec la programmation de tous les coins de la scène mondiale. Totalement pratique et accessible par tous, ce luxe location de condo dispose% / l'accès aux pistes de ski-in 100 qui est assez facile pour les débutants. Sinon, l'école de ski et les pistes sont seulement un escalator en métro. L'unité dispose de foyers au gaz, planchers de bois et les meubles qui sont à la fois accueillante et luxueuse. Profitez de la vue sur le village et la montagne depuis votre balcon chauffé (* pendant les événements de neige), tout en sirotant votre café ou votre thé du matin et votre après-midi après. Avec une cuisine entièrement équipée, lave-linge et un sèche-linge, des draps fins, des peignoirs, des pantoufles et des articles de toilette de première classe, tous les conforts de la maison vous attendent. Cette belle copropriété est entièrement mis à jour avec des téléviseurs à écran plat et des chargeurs USB facilement accessibles dans chacune des quatre chambres. La chambre principale dispose d'une belle cheminée et lit king-size avec des draps de luxe. Notre condo dort huit / neuf personnes très confortablement. Ménage quotidien composé de changement des serviettes et nettoyage léger, et un milieu de séjour consistant en un changement de la literie et le ménage plus approfondi est inclus. Nous allons gagner votre confiance et répéter des affaires en vous offrant le plus haut niveau de soins et d'engagement pour votre plaisir inégalé. The condo was perfect for our family of 5. It is very convenient to the Village and access to the slopes with ski-in/ski-out out off the Village Walk in the rear of the building. The owners have the condo setup well for visitors with all the needed essentials in the kitchen and bedrooms (including fans and humidifiers). We enjoyed our stay and plan to visit again. This is the best location for all ages - especially kiddos. Right in the heart of BC village - easy to run back if one of your little angels forget a glove or hat. Apres ski is all happening underneath the balcony - you can sit back and watch your older kids ice skate, experience the great shops and Resturants all located right by the condo. So easy to maneuver with your family and friends. Robin and Jenn were so kind and patient offering details and helpful with our requests/needs leading up to and during our stay. The cleaning staff were wonderful and kind too! Can’t say enough - other than we plan to rebook over and over again. Thanks! 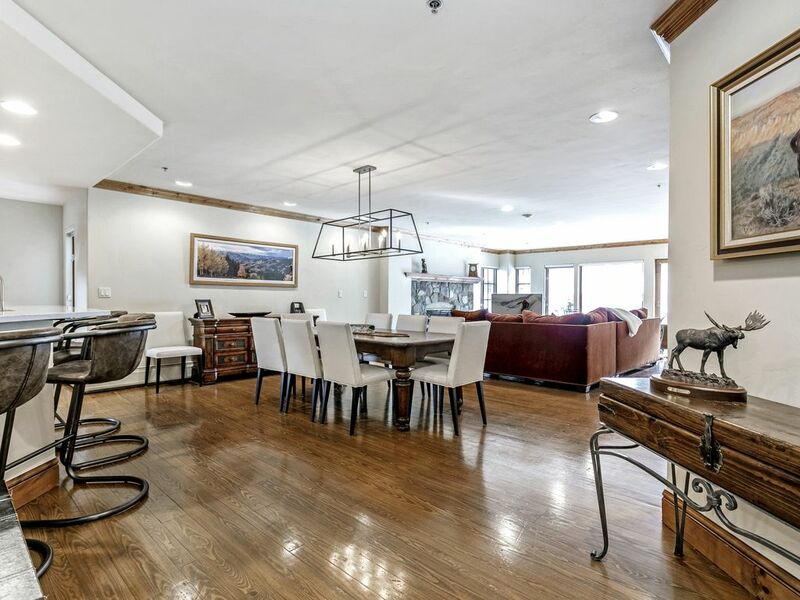 Ideal location in heart of Beaver Creek. Newly updated spaces. Clean. Perfect location. Will come again! We were returning guests to Market Square #106, and loved it as much this trip as we did on our prior trip. First, the location of the unit is perfect, especially for families with young kids, or in our case, our grandkids. The unit overlooks the ice rink, and the elevator is convenient to the unit. The kids gondola, as well as the kids playground, is only a two minute walk across the plaza with heated sidewalks (so no ice) and quick ride up two escalators. The kids ski school is just as convenient. The walk to the Centennial lift is less than five minutes, up three short escalators. The walk back to the unit after skiiing is even closer since you can ski down to near the kids gondola, pop off your skis and quickly walk across the plaza. All of the restaurants at the base (as well as the market) are at most a five minute walk. A couple of times, we just called in orders for pizza or burgers, picked it up, and ate in the condo. It was very convenient and easy. With the Market Square elevator and the heated plaza sidewalks, it is easy to take the little ones out in their stollers as well. Second, Market Square #106 is a four bedroom unit, but all on one level. There are no stairs to encounter, which is great for both grandparents and grandkids. We usually find it hard to locate condos as large as #106 that don’t have multiple levels. Third, the beds are comfortable and the finish out and amenities are top notch. They even supplied us with two port-a-cribs and a high chair, which made it both easy and convenient. Maid service comes every day to service the rooms, which again is not typical at many condos. There are even a few sleds in closet, so don’t miss the chance to take the two minute walk back to the slopes at the end of the day to take the kids sledding. Finally, the owners are extremely responsive and great to work with. We have never had any maintenance issues in our two stays here, but the owners are easy to work with to arrange the booking, and provide great instructions via email on check in procedures. In summary, we highly recommend Market Square #106, and plan to come back and stay there again in the future. Great location and kitchen! The service was also 5 Star. We truly enjoyed our experience and stay. The décor and finishings are Platinum quality, and the location is superb. Great views of the ice rink and the village. The service and daily cleaning were also outstanding. Robin was so helpful with everything. We really enjoyed our time and are hoping to come back again! Truly a nice apartment, we have been coming to Beaver and Vail for many years and this has been the best apartment ever. Robin and Jen as owners very responsive and super nice and Lisa the property manager also took care of everything we needed. The location can't be beat, right across is the Ice Skating rink, this is much better than a ski in and ski out in the mountain, as here you finish skiing, take electric stairs down to Ice Rink and come up with an elevator right to your apartment, and immediately you can go into Beaver Creek Village to ice skate, have a drink or just relax by the fire places right below your apartment or sit in your private balcony and watch folks skate, all which you could not do if you were in a house or apartment on the slopes. As to the apartment, very luxurious with everything you need, just go to City Market in Avon before you arrive, buy your groceries and enjoy a great week of skiing. Also you are a few steps away you have Base Mountain Sports shop and rental, which has great service and a nice variety of equipment.